Flue Steam provides the expert swamp cooler service Arcadia CA you need to keep your kitchen air circulating properly. 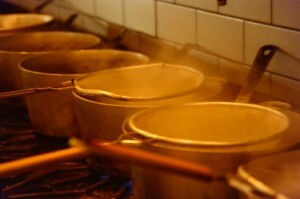 Removing hot air from a commercial kitchen is an important part of kitchen air control. So is ensuring that you have an adequate flow of fresh, clean, cool air into the kitchen. This is why kitchens have swamp coolers. Your swamp cooler provides an essential health and safety service by making sure that all the hot air leaving the kitchen gets replaced with cool, clean air. Getting regular swamp cooler service Arcadia CA from Flue Steam can help make sure you can rely on your swamp cooler to provide effective and reliable cooling. Do You Need Swamp Cooler Service Arcadia CA? During a swamp cooler service call, one of our expert techs will inspect all of the unit’s vital parts. We will replace any worn or damaged parts that we discover during the inspection. If no repairs are needed, we will still drain, clean, and reseal the unit to ensure optimum performance going forward. When you trust the experts from Flue Steam with your regular swamp cooler maintenance, you can rest assured the job will get done right.